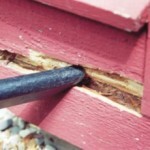 Last summer I used WEST SYSTEM® Epoxy to repair a small section of rot in a rough sawn cedar trim board on my house. 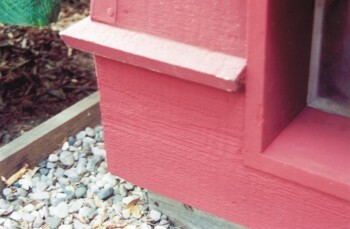 Before gutter was installed, the trim board was wet frequently, but well ventilated. Only a narrow center section of the #2 grade, 1″×12″board seemed to be vulnerable. 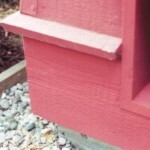 Replacing the board would have involved running to the lumber yard, making cuts to match a mitered corner and fit the piece around a small cat door. The fresh wood would also have to be primed before painting it. An epoxy solution, in this case, seemed the easy way out, and it made a good experiment. I’d had success applying latex paint over partially cured epoxy on previous projects, so I was confident this repair could be made quickly and last a while. I filled the cavity with WEST SYSTEM 105 Resin and 205 Fast Hardener, thickened with 407 Low-Density Filler and 406 Colloidal Silica Filler. I worked the mixture into all of the voids and filled it slightly higher than the wood surface. Several factors helped make this project “quick.” The gutter I put up a year earlier apparently helped stop the rot and dry out the board, saving drying time. Being able to use latex paint allowed the repair to be coated before the epoxy was fully cured, saving time and prep work. 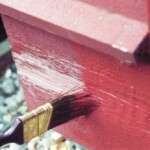 Most other types of paint must be applied over fully cured epoxy. The repair has held up well for a year—no sign of shrinking, cracking or paint adhesion problems. 1:00 PM: I started by digging out all of the soft , damaged wood. 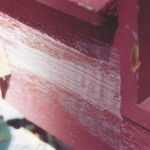 Only a small area of rot showed on the surface, but the cavity of rotted wood behind the paint was larger. A small chisel and a Swiss Army knife took care of the rotted wood. 1:10 PM: After digging and scraping down to solid wood, all of the loose material was vacuumed out of the cavity. I was prepared to dry out the cavity with a hair dryer, but was surprised to find the wood in the cavity dry. 1:15 PM: I filled the cavity with 105/205 (fast hardener), thickened with 407 Low-Density and 406 Colloidal Silica. I worked the mixture into all of the voids and filled it slightly higher than the wood surface. 1:25 PM: One key to making this repair quickly is the board’s rough sawn texture. I dragged a plastic spreader, with the edge scuffed up, over the thickened epoxy, simulating the wood’s texture. 3:00 PM: After an hour and a half in the warm temperature, the epoxy had firmed up, but was still slightly tacky. The epoxy texture blended pretty well with the rough sawn wood, so no sanding or other preparations were necessary. I applied one heavy coat of matching latex paint. 3:30 PM: Half an hour later the paint had dried, even though the epoxy was still curing underneath. The epoxy never shrank or otherwise affected the paint’s adhesion.The repair was essentially complete in two and a half hours, with about a half an hour of actual work.